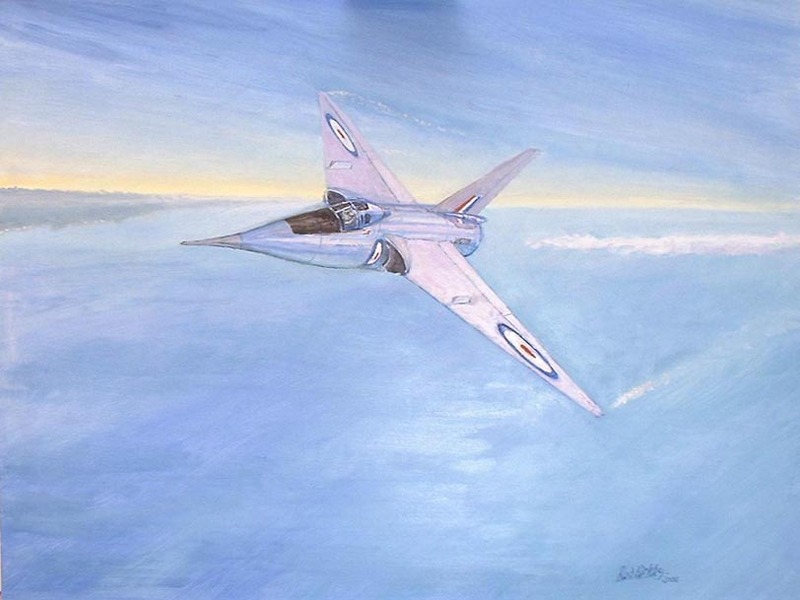 The Aviation Art of Rod Kirkby, Original Paintings and Limited Edition Prints of Aircraft. This site shows, without lengthy downloading times (for dial-up souls), some thumbnail pictures of some of my paintings, so that you can click on the image 'thumbnail', and see, in more detail, a better representation of the painting, together with some background to the painting. Some are available as Limited Edition Prints. The TSR-2 painting is available as a Limited Edition Print, countersigned by the pilots as well as myself. 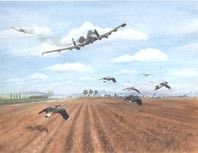 The B-17 coming in over Lavenham is also available as a Limited Edition Print. The Seafire painting is also available as a Limited Edition Print, signed by myself and the Seafire pilot, Gerry Murphy. The Miles M-52 painting is now available as a very Limited Edition Print, of only 50 copies, some of which are already spoken for, so get in quickly if you are interested. Feel free to 'phone me (at sensible UK times, please) on Cambridge (01223, in the UK) 292266. An answerphone will take the calls if I'm not available at the time you call. Alternatively, you could write out the following neatly before e-mailing! As you might have guessed, the higgledy piggledy writing is designed to make spamming less easy! If you would like to commission a painting, please contact me. (Cambridge (01223) 292266, sensible UK times, please). Prices are reasonable and negotiable, insofar as I can try to get as close as I can to your 'ideal' within the limits of your budget. Until I reach the dizzy heights of those artists whose names adorn prints all over the world, you will be buying my artistic skills without paying an extra premium for 'the name'! Oil paintings can provide as much, (or as little), detail as desired, and can be large enough to form an imposing centrepiece in a mess hall, or small enough to fit in the last remaining space on your living room wall. Generally, the larger the painting, the more expensive it will be to produce, but, below a certain size, the price stays essentially constant, as the time taken for various layers of oil paint to dry puts a minimum time for the production of even a small oil painting. Pastels are quicker and therefore less expensive, and pencil or charcoal drawings are quicker still. 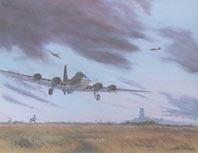 Watercolours can be quite exquisite, but do not suit some aircraft, and are well nigh impossible if a light coloured aircraft is to be portrayed against a dark sky. Watercolour is usually better suited to smaller paintings. Please call me to discuss your requirements and budget, and I'll do my best to suggest the best match. In short, I will endeavour to provide the best possible picture within your budget. You might wish to look at the text accompanying the Macchi-202 sketch, and that accompanying the portrait of Craig, for more background on the way commissions are painted. It goes without saying, but I'll say it anyway, just to cover myself legally, that all images and associated text are subject to copyright. Reproduction of these images and text in any way therefore constiitutes an infringement of that copyright, and legal action will ensue. The images are relatively coarse, partially to improve downloading time, and partially to lead you not into temptation! Anyway, guys, I'm trying to make a living here, and I'd really like you to buy the paintings or prints! Help support a noble cause, and help me continue to pay the bills. Incidentally, some years ago, the copyright laws were changed such that the artist now continues to own the copyright, even when the painting has been sold. That is, the buyer of the painting does not buy the copyright. Clearly, if an enlightened publisher wished to put any of my paintings into print, I would be pleased to discuss terms (royalties and/or up-front payment), but this would need to be agreed in writing before any such reproduction took place. If a painting is commissioned with the express desire of having it reproduced for, say, a particular squadron or group of people, then we could easily come to a suitable agreement. I have been mad about aircraft since I was six years old, and have been drawing them from that time onwards, starting with Meteors and Vampires, and moving on to Hunters and Swifts in the early fifties. To my great pride, my aircraft paintings and drawings were chosen to be put up on our classroom walls by our Form Master, covering about three of the four walls by the time I left that school! As a wide-eyed schoolboy, I was taken to the Farnborough Airshow in 1952, and witnessed the tragic mid-air break up of the DeHavilland 110, which resulted in the deaths of test pilot John Derry and observer Tony Richards; indeed, were it not for my lazy Uncle, who decided we 'would get a better view from beside the runway', we would have been on the hill where the two Avon engines ploughed into the crowd, killing many spectators, so I had a lucky escape! The 110 crash will be forever imprinted on my memory, but it did little to dim my enthusiasm for aircraft. Art was always my best subject at school, but I was also good at the sciences, especially physics, so, after gaining a Physics Degree, it will come as no surprise that I chose to join the Aerospace Industry, where I managed to get a job in the Aerodynamics Research Group of Hawker Siddeley Dynamics' Future Projects Department, where I worked on Project Feasibility Studies, gaining a reputation as an 'ideas and wood-for-the-trees' man. However, I never lost my fascination for drawing and painting aircraft, and continued drawing and painting as a hobby, attending various Art Classes, and joining the Guild of Aviation Artists as an 'Artist Friend', where some of the established members were enormously generous in helping me improve my technique and approach to art in general, and Aviation Art in particular. Now, I make a living as a representational artist, painting whichever subject the customer wants, from portraits to landscapes, wildlife, pets and cars (especially Italian cars and Jaguars!) but I suspect my greatest enjoyment will always be when painting aircraft, regardless of era or type. Aviation Art gives an artist freedoms that few other genres of representational art can match. The subject, often beautiful in its own right, (or at least, impressive), can be viewed from any angle, above, below, or anywhere inbetween, and, of course, can be climbing, diving, or banking as the painting demands. The horizon can be tilted to add extra drama to an action painting. The clouds can be used as compositional devices, placed wherever necessary to achieve a particular effect, and are stunningly beautiful in their own right. They can be layered gently, to produce a peaceful painting, or piled up into mountainous thunderclouds, with a dark threatening presence. I could go on and on, but you hopefully can feel some of the excitement that I gain from art in general, and Aviation Art in particular. I also enjoy teaching and demonstrating to art groups, helping to guide their efforts and sort out their problems, because I have 'been there' myself and have found many of the answers to other artists' problems. But I especially enjoy painting to commission. 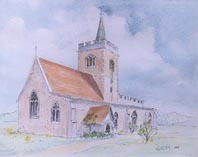 It is a wonderful and often emotionally rewarding experience to be able to listen to someone relating an incident from their past, and translate it into an artistic and realistic painting, capable of taking them back to a particularly memorable or significant point in their lives, be that a piece of aerial action, or a 'just married' couple with the Church in the background, or a well-loved holiday landscape. Please contact me if you think I might be able to help translate one of your cherished memories into a beautiful painting. tel Cambridge (01223) 292266 (Sensible UK times, please, if you are phoning from abroad). Please see the address under the 'Limited Edition Prints' heading....designed to elude the spammers, I hope! I heard of a whole series of allegedly true 'Pilot's Notes' on aircraft, followed by the 'Engineer's Comments'. Pilot......"Autoland a bit rough on this aircraft"
Engineer....."Autoland not fitted to this aircraft"
I also heard on the radio the following item, which I'm sure you will enjoy. Some policemen were using radar speed checking equipment to catch speeding motorists, and were perplexed when they briefly saw a reading in excess of 300mph, at which point the equipment stopped working! Though they didn't realise it at the time, they actually had a lucky escape, because the 300mph signal was due to their radar pointing briefly at a low flying Tornado! The automatic defence systems on the Tornado spotted the 'hostile radar', and swung into action to jam the radar AND achieve missile lock on the radar. Fortunately, the pilot used a manual override to prevent the missile being loosed off against the unwitting target. You can't be too careful! "This is the Hospital; if you require the Mental Health Department, please press '1'. If you are suffering from chronic dependency syndrome, get someone to press '2' for you. If you are a paranoid schizophrenic (change of voice tone here to 'sinister') .....We know who you are, and we'll contact you! If you are in a depressive condition, there's no point in pressing any buttons, because no-one will do anything about it anyway. Another factual item from a BBC programme, also nothing to do with aircraft. A man phoned the Police to say "There are two men who have broken into my shed and are stealing things. Could you send a policeman, please." He was told there was no-one available. After he'd put the 'phone down, he had an idea! He phoned the police station again, and said " I just phoned about robbers breaking into my shed. Well, you don't need to bother, because I've shot them!" Within minutes, several police cars arrived at his address, with armed policemen. They caught the robbers, red-handed. A policeman said to the homeowner, "I thought you said you'd shot them", to which he replied, "I thought you said there was no-one available"
I wouldn't advise you to try it yourself, but I liked his style!